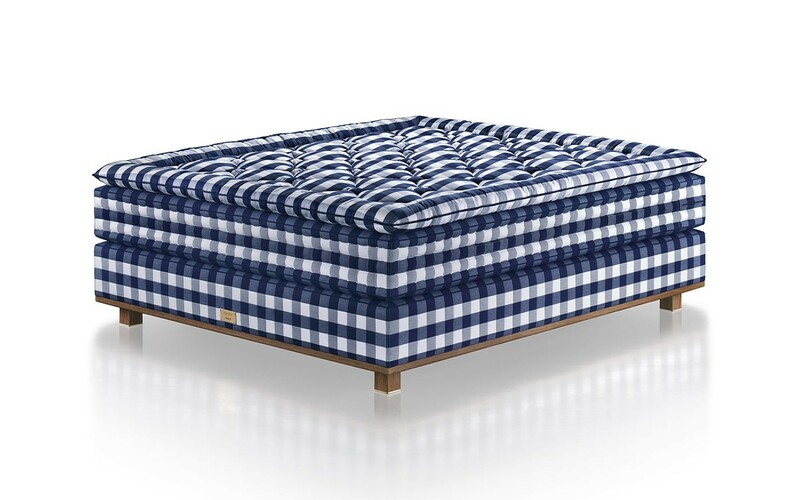 What happens when Hastens takes bed building co an extreme level? Maybe the best bed in the universe. Conceived and created just because we can. We’re told God created the world in seven days. It takes nine times longer to create a Vividus. Actually, nine weeks is just the tip of the iceberg. Truth be told, nobody can build a handmade bed like this from scratch in just nine weeks. It actually took us thousands of weeks to create Vividus. That’s 166 years with five generations of master craftsmen each refining their predecessor’s work to take the art of bed construction to a higher level. What began as upholstered cushions for horse-drawn carriages has, step by step, evolved into the bed you see before you. And after all that time, we’re still giving it our all to elp people arrive refreshed and alert for wherever life’s journey takes them. On the following pages, we will tell you the story of Vividus. It’s no coincidence that Vividus became a reality in Koping, Sweden. The bed is entirely handmade by Hästens’ foremost master builders, constructed from the ﬁnest natural materials. It is our homage to the uncompromising obsession of quality, care and passion that has been our hallmark through the years. him right as we pushed comfort and rejuvenation beyond what even we thought was possible. This is world-class excellence. It is knowledge and skill that refuses to rest. The Vividus project is much like space exploration. Space science invests enormous resources in something that seems to disappear into space. Yet the innovation it took to get there remains here on Earth in the form of revolutionary advances in material science, health and medicine, energy solutions, and computer technology. that this bed will beneﬁt all our customers in the same way that space exploration has. The innovations and lessons learned from Vividus will eventually find their way into the rest of our product range. When it comes to bed filling, horsetail hair is as close to perfect as nature gets, with characteristics developed over millions of years.. But we found the ways to improve it. For instance, the horsetail hair can still be slightly better by being longer. And naturally curling it into durable and springy spirals. A Vividus takes this to the extreme: Its hair measures 30 to 40 centimeters long. If you’re symphony-goer then you’re already a fan. That’s because this is the same type of hair professionals use to string the finest bows for the double bass. To explain vividus’ journey we’ve taken you to a small village in Sweden, the symphony, and outer space. All to convey our tireless dedication to perfection. If you want to travel quickly, travel alone. If you want to travel far, travel together. In the northern half of Sweden, there are only 4.8 residents per square kilometer. When neighbors are this sparse, the importance of cooperation and friendship is self-evident. choosing your travel companions wisely if you want to go the distance. 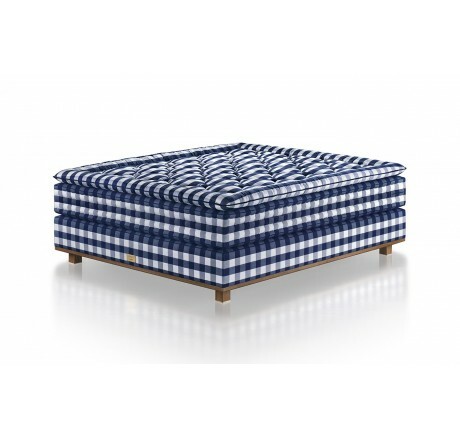 is truly exceptional, even by Hästens’ standards. Nine master craftsmen have been selected for the Vividus team. Set apart, in a secluded corner of our factory, they join bed frames, sew side-stitches, and attach spiral springs with precision down to the millimeter. They work closely together, side by side. Like the Bonnell springs in Vividus, they support and strengthen each other. These men and women know their trade. They take pride in every oak dowel and side—stitch. Each has been with us for a very long time. They began as apprentices and went on to construct our regular range as master craftsmen. Now they are creating one of the world’s best handmade beds and teaching their younger colleagues how to become the masters of tomorrow. same maternity ward. Together, they are Hästens’ greatest resource and pride. wood is anything less than perfect, we do exactly what is required — which is often to redo the entire bed from scratch. On a shelf behind the masters stands a lonely leg of oak. If you look very carefully at the top of the leg, you can just make out a crack. It is barely visible to the naked eye, and the bed would be as solid and reliable anyway. But it was enough to keep this leg from leaving our factory. To do otherwise would be unthinkable. versions that have up to ten legs, all to provide maximum stability and durability. Vividus is not for everyone. But if you want a bed to help you go the distance, look no further. Swedish pine and premium steel, is mostly bound together by thread that you begin to share the master craftsmen’s admiration for his simplest tool. However, this is not your ordinary sewing needle. It is 30 cm long and has a point on both ends. It is used to anchor all layers found inside a Vividus middle mattress horizontally to the sides of the bed. One could claim that the bed’s quality is literally hanging by a thread. It binds together the ﬂax felt that dampens sound and static electricity to the cotton, the wool, and the hand-spun mats of horsetail hair. It is also thread that keeps our springs in place - everything is held together by a thread and is hand-sewn. The thread provides strength in addition to natural ﬂexibility. And it is often one single thread that goes around the entire bed. Once the needle disappears into the side of the mattress it is up to the craftsman’s instincts to navigate through the ﬁlling and pocket springs and arrive at precisely the right exit point. This process takes one person four days. And if the only thing that remains to complete the side—stitching at quitting time is to tie up the thread, then it will wait until the next day. One mistake at this point would require the entire process to be redone. With stakes that high, you want a good night’s sleep to be at your best. Vividus top mattresses do not have zippers. They never need to be opened. And they’re sewn with a special diamond pattern with freestanding seams that ensure the extra-long horsetail hair reaches where it should and adjusts to your bodily movements. No sharp angles or corners should hinder the horsetail hair from moving freely and evenly. ensemble. It is taken from the very same roll of fabric that encases the bed frame and the top mattress. This way we can be absolutely certain that the blue-and—white color hues are exactly the same on all parts of the bed. Perhaps you think that all of this needlework for a single Vividus is rather extreme. Well then, you’re starting to get the point.